This medicine bag is made from butter soft black buckskin. 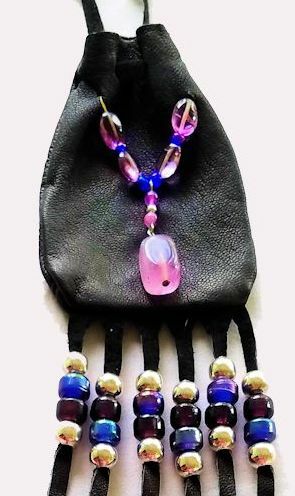 The pouch measures approximately 3.5" x 2 3/8" and is decorated with 5" long fringes decorated with amethyst beads, silver beads and cones, and dark amethyst and cobalt blue crow beads. This medicine bag has fringes along the bottom decorated with silver metal beads, glass crowbeads, tin cones, and coque feathers. 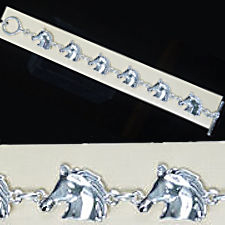 The overall length is about 23 inches. When the pouch is closed, the ends of the drawstring, which are also decorated with silver beads and glass crow beads, allows you to wear it as a necklace. Amethyst is a calming, protective stone, and is an excellent meditation tool that accelerates the development of psychic abilities. Amethyst is a "stone of spirituality and contentment." It facilitates trasmutation of lower energies into the higher frequencies of both the spiritual and etheral levels. Amethyst is a gemstone often worn by healers, as it has the power to focus energy. Amethyst helps overcome fears and cravings. It also helps relieve headaches, problems in the blood and breathing problems. Amethyst keeps the air and life force in the home clean and positive. When placed in a window that receives sun most of the day amethyst is very beneficial to use in healing and to heal negativity in the home. Place Amethyst in moonlight and everyone in the home will be feeling calmer. A medicine bag is a sacred item, a talisman, or amulet that carries personal power and protection. Medicine bags are ancient personal empowerment tools. Spiritually representing the wearer, they contain that which is most spiritually significant and healing to the individual to help guide and protect one on their journey. It can be filled with just one or several sacred objects and worn around the neck in order to keep them close to the wearer's heart. 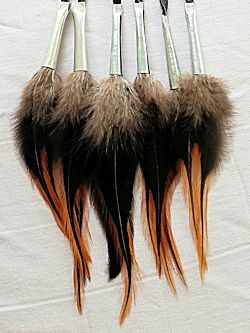 This might include collected spiritual objects or totems such as a small feather, beads, horse hair, animal fur or claws, herbs, healing gemstones, or crystals, seeds, photos, or anything significant to the medicine bag's owner. Because the contents of a medicine bag should be highly personal to the wearer, we leave it to you to collect symbols of what is important to you. Those items that are important to the wearer protect and ground them to our Mother Earth and the Creator, and bring them strength and healing. This medicine bag is ONE OF A KIND. All stitching is done by hand, no machine is ever used in the creation process. Each stitch is infused with prayer and healing intention for the highest good of all beings. Each Medicine bag that I create is energetically cleansed and ceremonially blessed upon completion. Its unique spirit is honoured with deep reverence. This product was added to our catalog on 06/16/2018.